West Celebrates No. 1 with "Broken Things"
Nashville, Tenn. (Feb. 8, 2018) - 4X GRAMMY® Nominee Matthew West performed at the National Prayer Breakfast this morning in Washington D.C. West was invited by IL congressman, Randy Hultgren, to attend the breakfast after meeting with representatives to advocate for songwriters' rights this past November after performing at the opening of D.C.'s Museum of the Bible. 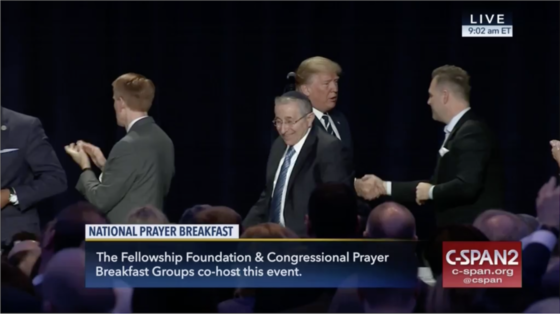 Held at the Washington Hilton for its 66th year with over 3,500 people in attendance, worldwide leaders from over 100 countries gathered at the National Prayer Breakfast for the opportunity to form and strengthen relationships with prayer as the mainstay. "I felt tremendously honored to sing at the 66th National Prayer Breakfast. To see thousands of people from all over the world coming together in our nation’s Capitol to pray and to acknowledge that we are one nation under God was something I will never forget," reflected West. "Just before I sang 'Grace Wins,' Rep. Steve Scalise shared his powerful comeback story of a miraculous recovery from a near tragic shooting last June. I couldn’t help but smile as I thought of the lyrics I was about to sing. 'No more lying down in death’s defeat, I’m rising up in victory, singing hallelujah, grace wins every time.' I’m leaving today’s event reminded of the power of prayer and the importance of us praying for our nation’s leaders." 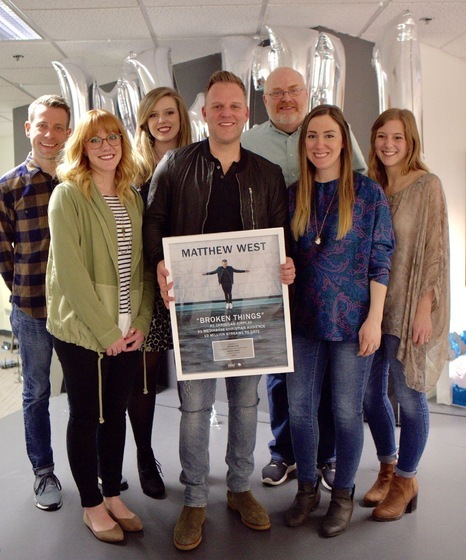 This past Tuesday, Capitol Christian Music Group's radio team surprised West with a plaque commemorating "Broken Things" hitting No. 1 on the Christian Airplay chart. His eighth career No. 1, the hit song is on West's latest, All In (Sept. 22), framed around his desire to go "all in" in every area of his life including, faith, family and relationships. February and March will find West touring arenas nationwide as part of THE ROADSHOW Tour alongside for KING & COUNTRY, Natalie Grant, Zach Williams and more, hitting 23 markets throughout the U.S. THE ROADSHOW Tour kicks off Friday, Feb. 16, and the all-star lineup will visit Ontario, Seattle, Reno, Dallas and more. For the latest touring information, click here. Matthew West is a four-time GRAMMY® nominee, a multiple-ASCAP Christian Music Songwriter/Artist of the Year winner and Dove Award recipient, and was awarded an American Music Award (2013), a Billboard Music Award (Top Christian Artist, 2014), a K-LOVE Fan Award (2016), and named Billboard’s Hot Christian Songwriter of the Year (2016). West also received a Primetime Emmy® Award nomination for Original Music & Lyrics for “The Heart of Christmas” from the film of the same name. In addition to his own recording career, he has co-hosted the K-LOVE Fan Awards three times and has more than 130 songwriting credits to his name, including cuts by Rascal Flatts, Scotty McCreery, Michael W. Smith, Amy Grant, and Mandisa, among others, and number one cuts by Casting Crowns and Danny Gokey. Selling more than 1.6 million albums to date (TEA), West’s discography includes acclaimed releases: All In (2017), Live Forever (2015), GRAMMY-nominated Into The Light (2012), The Story of Your Life (2010), Something to Say (2008), History (2005) and Happy (2003). Well known for communicating stories through song, Matthew West has received thousands of stories from around the world. His studio album, Live Forever (2015), continued that storytelling theme and debuted at No. 1 on the Billboard Christian Sales Chart. He has obtained numerous No. 1 singles, most recently with "Broken Things," while achieving a record-setting No. 1 for 17 straight weeks at radio with “Hello, My Name Is” and “The Motions” for 15 weeks. Adding author to his list of accolades, West has written five books to date: Give This Christmas Away, The Story Of Your Life, Forgiveness, Today Is Day One, and his newest release, Hello My Name Is. He is also passionate about providing hope and healing through the power of prayer and story, so along with his father Pastor Joe West he founded popwe, a non-profit ministry helping others to craft, share, and live a more meaningful life. Please visit popwe.org for more information.